New ad with a lower price. Did you know that Western Union and MoneyGram have transfer limits? Garage Kept Since new,Well Maintained ! This trailer it's in great conditions and are fully loaded ! The only thing fully loaded here is the bull$hit he's going to give you when you reply to the ad. At this moment I am in the military base in Hungary (Europe) getting ready for Afghanistan. This mean that I do a special training program and I am not allowed to get out of the base or give calls whenever I want.The trailer is already at the US Army logistics dept. in WA sealed and ready for shipping. The shipping can't be a problem because I can do it at no cost for you. 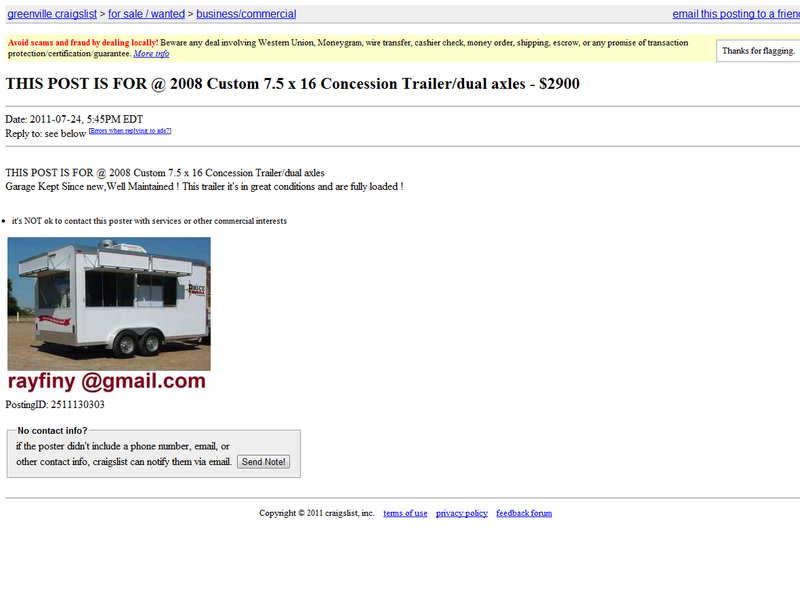 You will receive the trailer along with all the documents including title and the bill of sale . 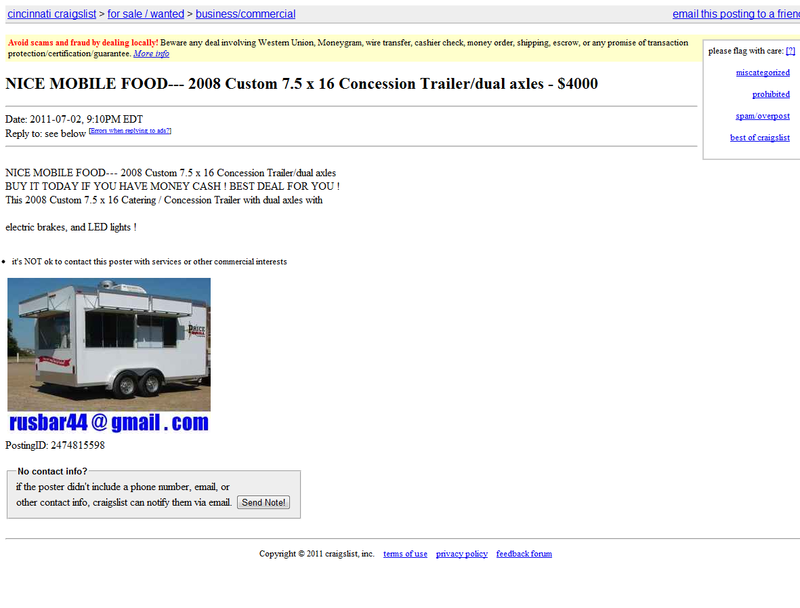 Thank you for your interest in my 2008 Custom 7.5 x 16 Catering / Concession Trailer. The general condition of my trailer is excellent,very well maintained, no damages and no mechanical problems, no electrical issues. The trailer at this moment it's in Alaska in BP OIL SHIPPING COMPANY storage facility ready for shipping.The trailer and all the sale documents are into BP OIL SHIPPING COMPANY possesion. Price was reduced to $4,000 (URGENT SALE) as I need to sell this trailer in two weeks because I have troubles with my bank and I need to pay the loan for my house and I prefer to sell my trailer to resolve the money problems and more of that I will not be in USA for the next 18 months. I want to tell you that I work for BP OIL COMPANY( EUROPE DIVISION ) and now I'm in Hungary, Europe on the offshore Oil Rig. I tell you all these because I'm not in US and for the moment I'm on the oil rig and this transaction will be done only on internet because here on the oil rig I don't have phone access. I hope will not be a problem for you to discuss with me the terms of sale by email . If you want to buy my trailer for my price please email me back and I will let you know how we will done this transaction. The trailer is now at the USArmy - Military Auto Transport Dept for POV(Private Owned Vehicle) in Fort Lewis, WA. Price was reduced to $2,900 (URGENT SALE) as I need to sell this trailer in two weeks because I will leave with my platoon in another mission outside US. I'm US army member and now US Army give us the chance to buy some shares at BNSF RAILWAY.Co at half price and for this reason I need a fast transaction. Thank you for your interest in my 2004 Caterpillar 416D Loader Backhoe with 2100 hours! The general condition of my cat is excellent,very well maintained, no damages and no mechanical problems, no electrical issues. The cat is now at the US Army - Military Auto Transport Dept for POV(Private Owned Vehicle) in Fort Lewis, WA. Price was reduced to $7,000 (URGENT SALE) as I need to sell this cat in two weeks because I will leave with my platoon in another mission outside US. I'm US army member and now US Army give us the chance to buy some shares at BNSF RAILWAY.Co at half price and for this reason I need a fast transaction. Because it's a large transaction we will complete the deal only using an authorized third party like Google Checkout, using their Buyer Protection Program. The payment will be handled by Google Checkout and you will benefit of a 5 days inspection period and you will have the option to accept or reject the cat. The scammer is back at it. 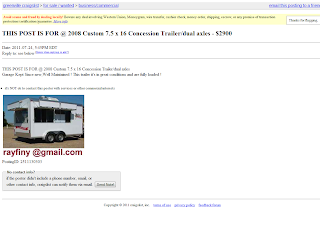 Thank you for your interest in my concession Trailer 2008 Custom 7.5 x 16 Catering. The general condition of my trailer is excellent, very well maintained, no damages and no mechanical problems.The alloys are all presentable and original;all tires in good condition with plenty life remaining;has all tests passed. The TITLE is CLEAR, registered under my name, no lien or loan.The trailer is in Chicago, IL and in case it gets sold I will take care of delivery. Price is $4,900 (URGENT SALE) as I need to sell this trailer before I will leave with my platoon in another mission outside US, now I am in the military base from Hungary (Europe) where I do some special trainings. I will be deployed to a US Forces Japan base for an entire year.